Berrie Garden Design | Inge Berrie works in Surrey and South London producing bespoke garden designs in 3D ,for clients who need the help of a qualified,professional garden designer. The garden can often be a space where home owners don’t know where to start with making the space functional and attractive. Unlike the inside of the house which is static, the outside space changes throughout the year and needs regular garden maintenance. 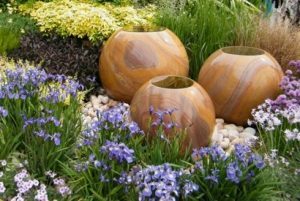 We help you to create a garden to meet your specific needs .These may include accommodating children, pets, low maintenance planting, allergies and easy to care for hard landscape materials for large or small gardens.All styles of design are accommodated from traditional to contemporary. Different design packages are available to suit your size of garden and budget e.g. the full design service or advisory/consultancy service. Each client receives a detailed initial consultation in order for us to understand the the space and what is required. The full design service offers a 3D scaled drawing using Vectorworks software to help the client to visualise the end product. A plant design drawn to scale takes colour,style,soil conditions,aspect,budget and maintenance needs into consideration. A bespoke maintenance schedule can also be produced to help you maintain the design. We work closely with reputable landscapers and other garden related professionals to build the garden. A list is available of recommended landscapers,gardeners, lighting specialists, irrigations specialists and suppliers of materials for patios, driveways,fences,ponds,artificial lawn etc.